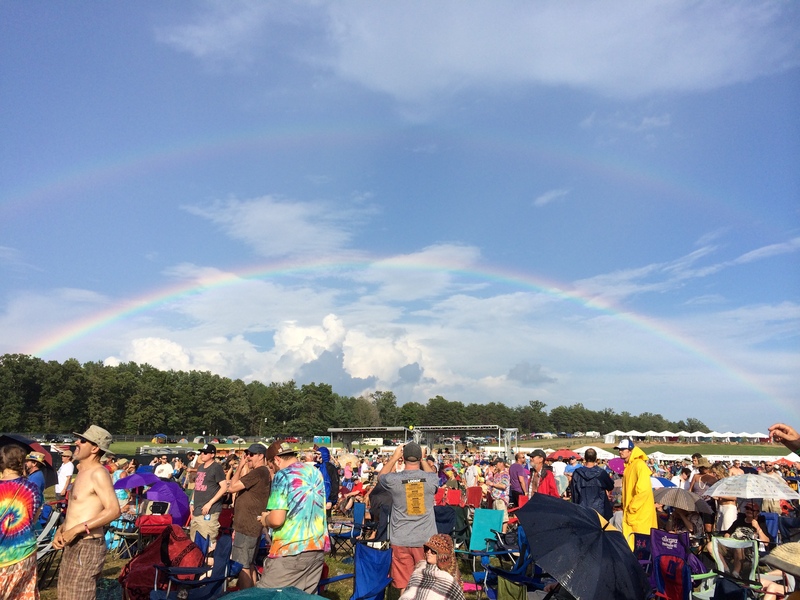 A double rainbow over Lockn 2014. Hopefully a sign for 2015 Lockn once it opens after storm delay. A microburst storm hit the Lockn site just before they were to open, causing the festival to cancel the first day and keep the site closed. Thousands of campers and fans arrived before getting the word of the delay and had to find a place to spend the night. Nelson County breweries tweeted invitations to the fans. Businesses and individuals, as well as government groups, helped coordinate the efforts to find people places to stay for the evening, either camp sites or hotels. Way to come together Virginia and help take care of these travelin’ music fans! The line up and schedule for Lockn has been adjusted and they plan to open “first thing” Friday for campers. Lots of talk on social media about whether Lockn will offer refunds or anything to help those who had additional expenses for accomodations and the lost day of music. Festival organizers have rightly been focused on site preparation and safety. But this topic may come back up again later. Meanwhile, fingers crossed for warm, sunny Virginia days ahead, like the one above from Lockn 2014. This entry was posted in Festival Preview, Virginia and tagged Lockn by Teresa. Bookmark the permalink.